There are a few different types of cover letters but here we are concentrating on the cover letter you would use when you are applying for a specific job opening. 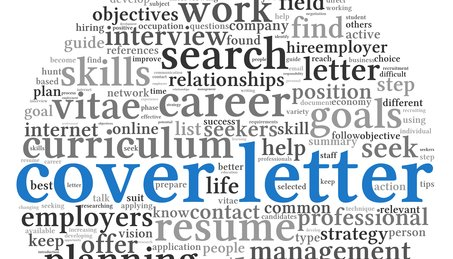 A cover letter is a formal letter that accompanies your CV. It will outline who you are and why you are sending your CV to the company. The opening address of an apprenticeship cover letter is crucial. You need to address your cover letter to the name of the person who will read it. Addressing an apprenticeship cover letter to the wrong person suggests you haven’t done any research of the company. It suggests you haven’t bothered paying any interest in who it should go to. Employers often include the name of the person who you are to send your CV to in the job vacancy. Look for this! However, if the name of the person is not given in the job vacancy, you have a few options. • Call up the company and ask for the name of the person who you can send your CV to. • Email them if an email address is available. • Address your apprenticeship cover letter to the manager of the department your apprenticeship is on. • If you are still stuck and they have a HR department you can contact them. DO NOT address your cover letter to Dear Sir/Madam OR To whom it may concern. It gives the impression you are sending many CV’s to many different employers. It doesn’t give a good impression. Once you’ve addressed your cover letter correctly you want to specify what position you are applying for and where you found the vacancy in the first place. This is because employers are often hiring for multiple positions at the same time, so you want to make sure you are being considered for the right role. Tell them you have enclosed your CV, so there is no confusion. Now that they know why you are writing to them you can now explain to the employer why you are interested in the position. Once again you can use your research of the employer and remind yourself of the company values/vision, any major projects or been in the news recently. Also refresh the information on the actual apprenticeship you are interested in. You can now start to explain why you are interested in this company and this apprenticeship. NTW’s priority of being an employer that makes the best use of its talent of the entire workforce aligns with my desire to learn and develop skills and have a career with an organisation who values its staff. You can now start describing your qualifications and work experience and why it links and makes you ideal for the apprenticeship. What skills you can bring to the company. Explain how your unique skills, qualifications and work experiences make you an ideal candidate to be considered for this apprenticeship. Remember to always keep the content relevant to the role you are applying for! You don’t need to cover interests here. In your final few sentences you can thank the employer for considering your application. Express that you would enjoy the opportunity to have an interview so that you can discuss the apprenticeship programme in more detail. This continues with your enthusiasm to get an interview and ultimately a job. You can read through the job description and highlight the main keywords that are the skills, experiences and qualifications that are a vital requirement of the job. Then use some of those words in your letter. This allows the employer to see at a glance that you are a match in these areas. Your cover letter is the first thing the employer will read so make sure it’s perfect. Read through your letter, proofreading it for any spelling or grammar errors. Ask a family member, teacher/tutor or careers advisor to read it as well. Some employers will ask you to email a CV and cover letter to them. If this is the case, write your name and the title of the apprenticeship you are applying for in the subject line. This will ensure it stands out and they know exactly what the email contains.